The following story is contributed by the Florida Museum of Natural History, www.flmnh.ufl.edu . Researchers at the Florida Museum of Natural History and the University of Winnipeg have developed the first detailed images of a primitive primate brain, unexpectedly revealing that cousins of our earliest ancestors relied on smell more than sight. The analysis of a well-preserved skull from 54 million years ago contradicts some common assumptions about brain structure and evolution in the first primates. The study, which first appeared online June 22 in the Proceedings of the National Academy of Sciences, also narrows the possibilities for what caused primates to evolve larger brain sizes. The skull belongs to a group of primitive primates known as Plesiadapiforms, which evolved in the 10 million years between the extinction of the dinosaurs and the first traceable ancestors of modern primates. 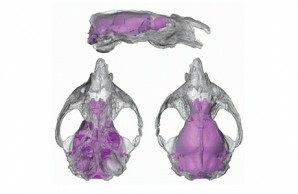 The 1.5-inch-long skull was found fully intact, allowing researchers to make the first virtual mold of a primitive primate brain. Researchers used CT scans to take more than 1,200 cross-sectional X-ray images of the skull, which were combined into a 3-D model of the brain. This image shows a translucent rendering of the brain as it would fit inside the skull of the 54-million-year-old primitive primate, Ignacius graybullianus. The CT scan technique has become an accepted method for fossil studies but most often involves medical scanners that are repurposed for fossils. By contrast, the primate brain study used a more powerful industrial-strength high-resolution scanner at Penn State University. Claire Dalmyn, an undergraduate student at the University of Winnipeg and paper co-author, traced more than 800 X-ray images of the braincase. The effort took nearly a year and produced one of the best endocasts they had ever seen for an extinct mammal. “I couldn’t believe what we were seeing,” Bloch said. Primate brains tend to be dominated by cerebrum, the most highly evolved part of the brain, making it difficult to look at functional areas and forcing researchers to focus solely on brain size. 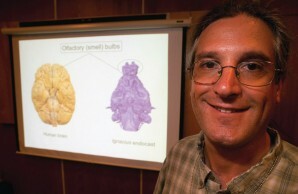 “Brain size is interesting, but it’s quite difficult to interpret because in one brain, 50 percent could be made up of olfactory bulbs, and in another brain, 50 percent could be made up of visual processing areas,” Silcox said. In the primitive primate, the cerebrum had not yet evolved to the point where it covered all of the other functional regions of the brain. As a result, the relative sizes of different parts of the brain provide a better picture of brain function and the early stages of primate evolution. The specimen came from north central Wyoming, near the entrance to Yellowstone National Park. The intact skull is a rare find that allowed the primate to be studied this way for the first time, Silcox said. “This is very exciting in terms of the history of paleo-neurology, the history of the study of brains in the fossil record,” Silcox said.